Super cut blade 58mm dia., 80 teeth, individually set and sharpened, is included. Quiet, high performance 230V motor for prolonged use. I used this machine to cut up some of the wood for my beam engine project. This is a nice small table top machine and as stated in the manufacturers specs it is quiet. It is a very simple circular saw as there is no height adjustment for the blade and just one speed. 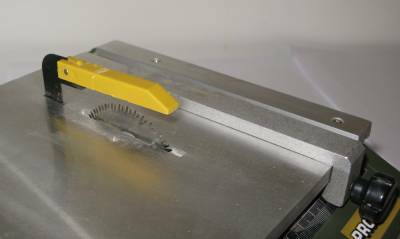 The cover over the blade is minimal and so some care is needed as although this is a small machine it would make a nasty mess of your fingers. Realistically this can cut up to 1/4″ (6mm) but only with some real care and watching the feed rate on the wood. Up to 1/8″ (3.2mm) it is absolutely fine and is happy with hard and soft wood. Next to the switch is an LED that glows green when you switch the machine on and changes to orange then red if you feed wood in too fast and the load goes too high. Be very careful as it is too tempting to watch this and not notice that you are feeding your fingers into the saw. Use an off cut of wood to push the workpiece into the saw. I must admit that I would be tempted to cover the LED with some tape once I was happy that I coul hear the change in blade speed and recognise from this when it was being overloaded. Price: approx. £85.00 from Axminster Tool Centre. The thickness of material that you can cut with this saw is very limited. 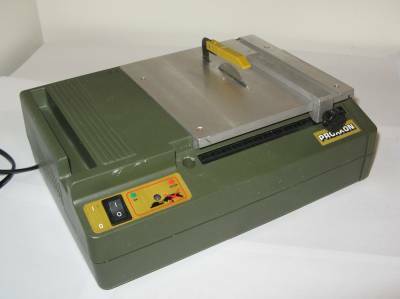 However, if you are looking for a saw to strip down small pieces of wood for skirting boards for dolls houses or planking for a model boat then this saw does the job very well. This would suit the model aircraft builder as well as it is more than happy stripping balsa wood up.